My first escapade to NYC was in the summer of 1995. Freshly graduated from high school I studied at the Joffrey Ballet in Greenwich Village. Though my childhood in Texan suburbia did not prepare me for the cosmopolis that awaited me, my love of dance and music and poetry certainly did. While gaping at all of NYC’s delicious summer-ness, I found the home of Edna St. Vincent Millay — my favorite poet — while strolling through the Village. 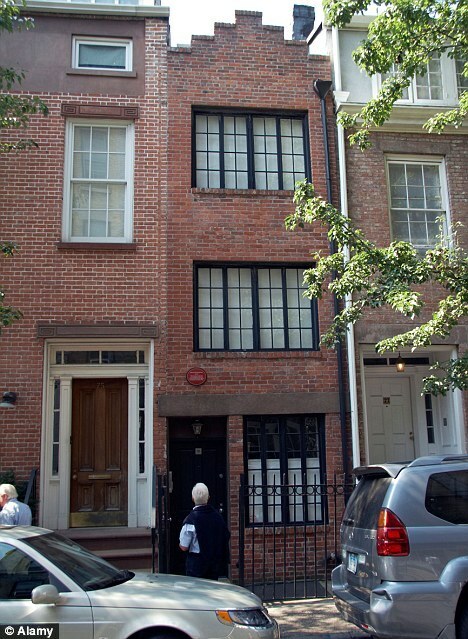 Also called “The Narrowest House in the Village” 75 1/2 Bedford Street had also been the home of Cary Grant and John Barrymore. Big celebrities. Very small house. I admit that nearly every time I am in NYC, I still go back to visit this little house because I have this secret dream to one day live there. Read today that my dream house is on the market. You know — only $4.3 M, which is $4,343 per square foot. Ouch! How is a poet supposed to live there? Moreover, the price of the house has DOUBLED since it was last on the market in 2010. YIKES! My curiosity piqued and so I found some photos and floor plans to see what kind of renovation work has been done and it looks so BLAH! I would expect that a house with this much creative history would be renovated to at least some historic capacity (it was built in the mid-1880’s), right? Nope., another white and beige gut. Too bad, I say. So, since it seems that all poetry has been covered up in paint and expensive marble and since this isn’t quite in my home buying financial plan, I will have to let someone else purchase her for now. I do hope, however, that they love Edna St. Vincent Millay as much as I do. If you would like to see pictures of the interior of the house, click here. Next Paul Simon is back! I was there! Meanwhile, for $4M, my guests on the third floor should not have to go to the basement to pee. I agree that the renovation lacks the character that the house deserves. Disappointing, right? That was a fun day — strolling through the Greenwich Village street fair. That is definitely my favorite NYC neighborhood when I’m feeling bohemian. Tribeca – my fave neighborhood when I’m feeling chic.